Canada Mortgage and Housing Corporation has released it’s spring Rental Market Survey, which shows that the average vacancy rate remains stable. The current vacancy rate (primary, purpose-built apartments) in 35 major regions was 2.9 in April 2015, compared to 2.7 the same time last year. A CMHC spokesman noted the lower rental demand in oil-producing provinces, namely Saskatchewan and Alberta, but says this trend is offset by higher demand in Ontario and B.C., keeping the national rate nearly constant over the past year. Regionally, Ontario saw an increase in millennial renters with jobs, which drove down the vacancy rate there. Immigration was a factor in British Columbia, providing a steady stream of renters which kept demand healthy. Guelph, Victoria and Vancouver saw the lowest vacancy rates as of April, 2015. In contrast, Moncton, Saint John and Gatieneau showed the highest. 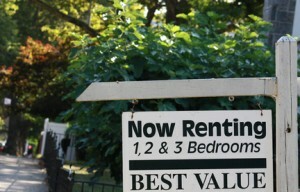 In terms of rents, the Rental Market Survey pegged $949 as the national average for a two-bedroom apartment. Vancouver’s average is the highest at $1,345. Calgary rents averaged $1,319, while Toronto came in at $1,269. The lowest average rent for a two-bedroom was in Trois-Rivières at $571. Additional information on regions surveyed can be found here. CMHC’s Rental Market Survey is conducted twice a year in the spring and fall. The spring surveys cover structures containing at least three rental units, whereas the fall survey breaks city centres into smaller blocks, and tracks secondary markets including rented condos, single families, duplexes and secondary suites.